Do you think the cold damaged your connected sensors? Home/News/Do you think the cold damaged your connected sensors? With this winter time, humans are not the only ones to fear the sub-zero temperatures. The return of cold conditions will directly affect our cars and phones batteries. Will these temperatures also affect our wireless recorders functioning ? At Newsteo, we use, for most of our connected sensors, Lithium thionyl chloride batteries. One of the strongest points of these batteries is their operating temperatures going from -40°C to +85°C.. The lithium battery electrolyte is a non-aqueous solution. No water, no freezing. The cold, at a certain extent, doesn’t affect their proper functioning..
Another strong point is their long life. Indeed, we have selected very high quality batteries. Thanks to this, we can guarantee a maximum reliability reliability of our products with, according to the references, more than 3 years of battery-life. If cold does not disturb their proper functioning, now the question is: Do heat and cold affect their battery life? . 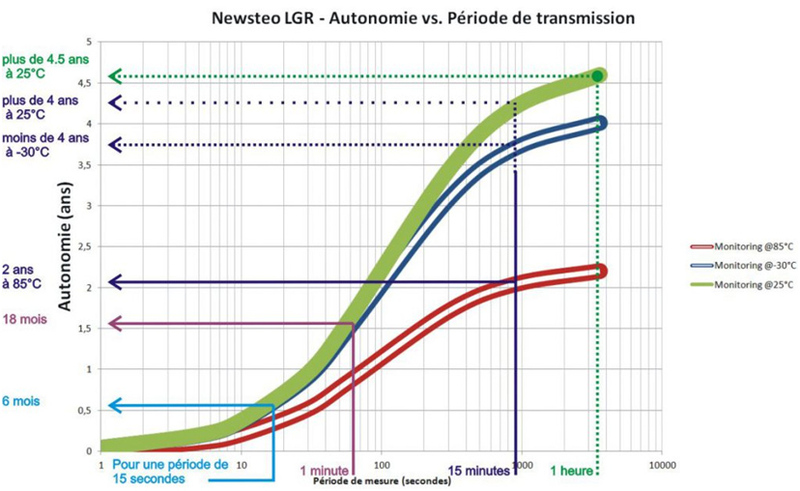 The following diagram* shows the Newsteo Logger LGR range product life, when operating: on one hand, the transmission frequency and on the other hand, the ambient temperature. We note that with the same transmission interval, a product subjected to a -30°C temperature, will have less life than at 25 °C. For example: on an identical 15 minutes transmission interval, a battery will last from 3.5 years at -30 ° C to 4 years at 25 ° C (so a 6 months difference on average). But if we look at the high temperatures, always on the same 15 minutes transmission frequency, we can see that the battery life reduces to 2 years (so 2 years less than at 25 °C). Remember: : the negative temperatures affect the battery life, but in a lesser proportion than the high temperatures. That’s why we propose a dual batteries special pack compatible with some recorders models allowing tripling your communicating sensors life, with equivalent operating conditions of course. Do not hesitate to contact us if you want to take advantage of it. *The chart provides an estimate of the battery life, not contractual. Newsteo gives you the most accurate and detailed information as possible, but cannot know the exact conditions of use of its products.